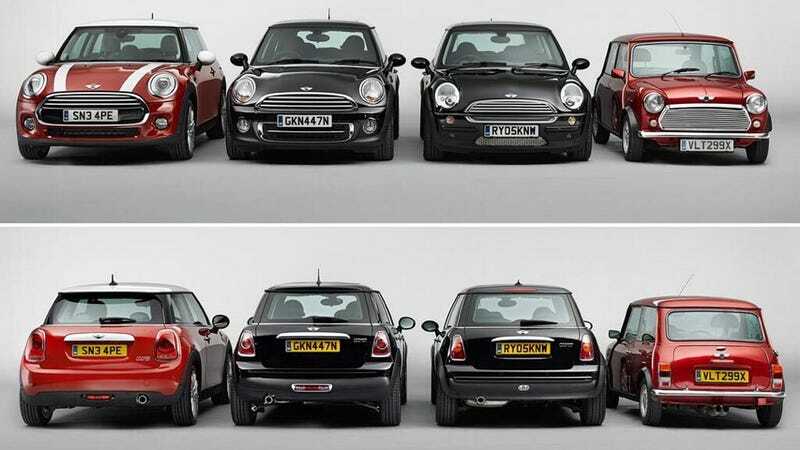 Every new Mini has grown, including the 2015 Mini Cooper that was revealed earlier today. But one rarely has a sense of the scale of growth because you normally don't see every Mini next to each other. What's really noticeable is how much the hood height of each generation of car has grown. The Mini is still a small car, but this newest one has a far higher belt-line and hood, larger tail lights, and more exaggerated features. Cool to see the evolution, sad that it's gotten this much bigger.